Trafalgar Wharf: Matt's Going to The Jubilee Jamboree! 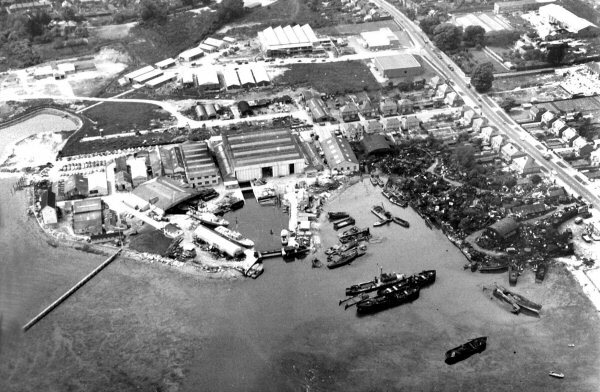 As the Queens Diamond Jubilee takes place this weekend we thought it might be interesting to see what Trafalgar Wharf looked like in 1952 when it was owned by Vosper Thornycroft. Back in those days The Drystack was used for building boats such as 'Brave Challenger' which is still one of the fastest Super Yachts in the world! Look out for Matt this Sunday, our Sales and Marketing Assistant, in the Thames Diamond Jubilee Pageant. But if you would like to watch some celebrations on the South Coast then how about watching the Cunard's Three Ship Diamond Jubilee tribute to The Queen on Tuesday 5th June with the first ever Red Arrows display over Southampton. We hope you have a lovely long weekend keeping The Drystack busy and raise a glass with us to The Queen.